Well, sort of. Wannabe farmers? Yuppie farmers? Or… Hipster farmers…? Anyway, I’ve wanted either chickens or ducks for years but wasn’t really in a position to get any until now. When we moved into the barnhouse we hummed and hawed over it. Was the timing right? Did we really want to make that commitment? What would we do when they stopped laying eggs? 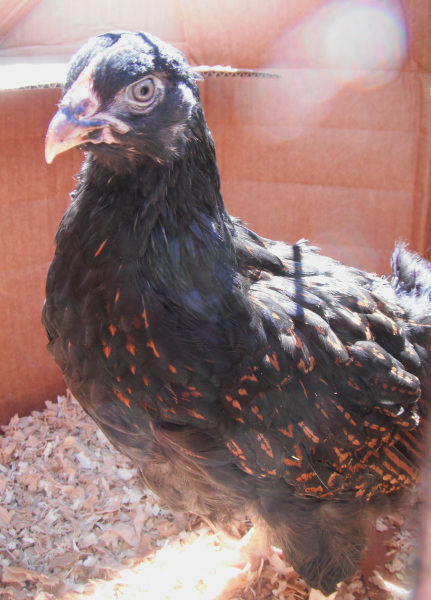 When J an I finally decided to take the jump into poultry ownership I set to work researching the best breeds for us. Without question, I knew we needed at least one Belgian Bearded d’Anvers so we could have mini Belgian chickens to go with our mini Belgian dog. I finally decided on a Brabanter, a Barnevelder, and a d’Anvers. Then chicken math struck. Now, chicken math is this thing where you always end up with more chickens than you planned on. I thought I was immune to chicken math. I was naive. In the end when we got to the farm none of the Brabs left were crested (the crested gene is dominant, so sometimes you get two recessives and a crestless bird is born), and I really wanted that mohawk so the Brab was out. At first I figured since we weren’t getting a Brab I would get two d’Anvers, but there were only three and I couldn’t just leave one all alone. So there we were, packed into the little two-door Pontiac G6 with an eight week old Barnevelder and all three d’Anvers nestled together in a little berry box (which was housed inside the Barnevelder’s orange box for warmth) for the stressful four hour drive home. I justified it by telling myself two bantams basically equals one standard, so technically I have exactly as many as I planned. I lie to myself like that all the time. Suki wasn’t quite sure what to make of the new additions at first. Suki has been surprisingly good with them. Once she wrapped her head around these weird creatures in the house anyway. She got really excited when the Barnevelder tried to take a dust bath, but aside from that she mostly just casually watches them. Her biggest concern is making sure I don’t forget about her. When I’m sitting watching the chicks she will Velcro herself to my leg. The Barnevelder is almost 9 weeks old. They’re originally from the Barneveld region of the Netherlands. 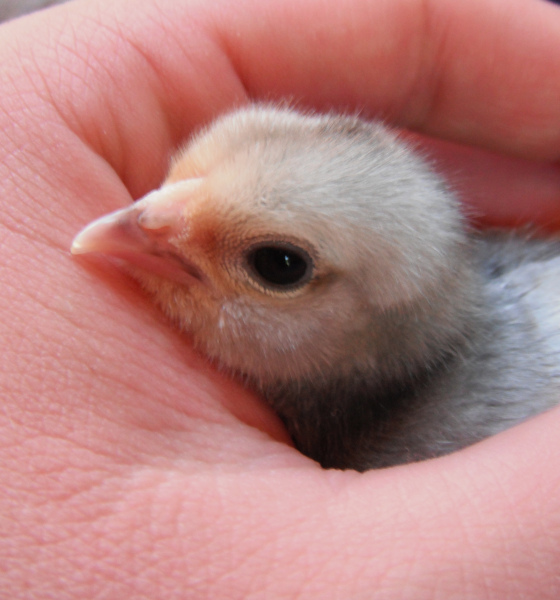 Barnies are very gentle birds, so much so that it’s not unheard of for the roosters to help raise chicks. They come in both gold and silver laced colour, with either black or blue lacing. Full grown she should weigh between 2.3-2.7 kilograms (about 5-6 pounds). Our Barnie seems to be living up to her breed’s description as sweet-natured. The first night she was home she pitched an all-out fit until I opened her cage and let her sit in my lap. 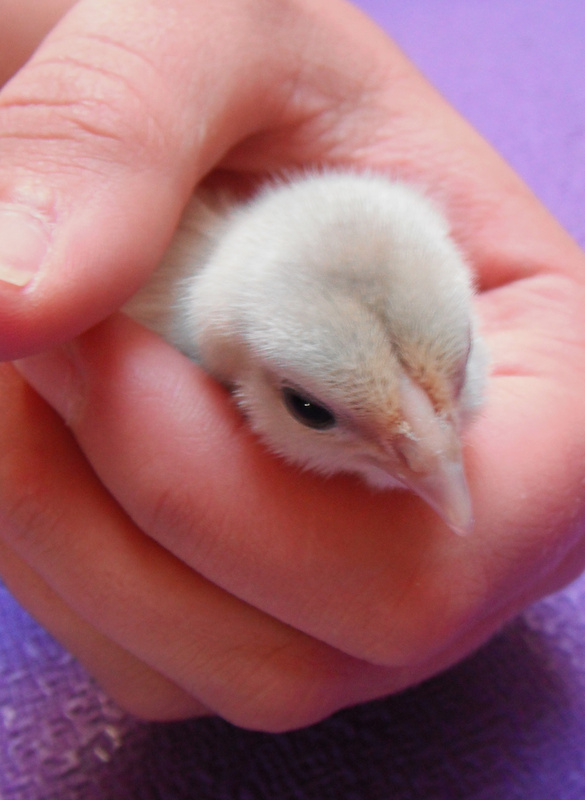 I knew chickens weren’t robots, but I had no idea they could be this affectionate. She loves to be petted, and she’ll happily hop into my lap for attention or perch on my hands. When I took her outside to scratch around she followed me around the run and crouched under my legs when I sat down. 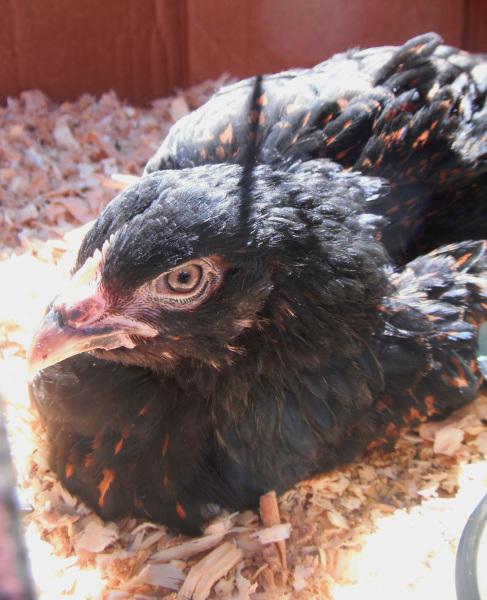 She had her tail feathers plucked out by another bird at the farm, but they seem to be growing back nicely. Now for the babies. At exactly one week old, they’re really only just beginning to develop their own personalities. Temperament-wise Belgian Bearded d’Anvers are the Schipperkes of the chicken world, and are from the Antwerp region of Belgium. 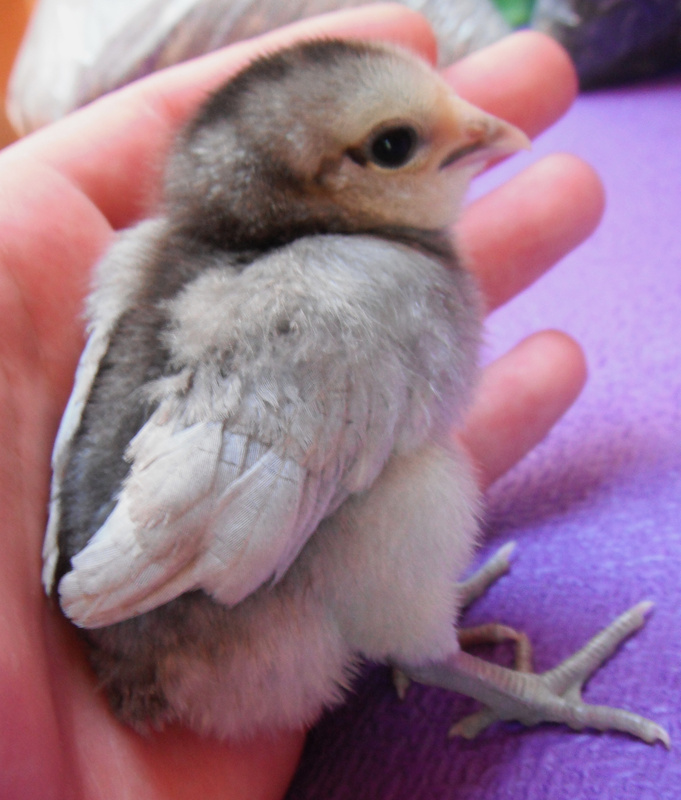 They’re a true bantam, meaning they’ve always been small and weren’t miniaturized from an existing standard breed. Full grown they should weigh about 620-730 grams (around 1.5 pounds). They come in a variety of colours. My darker two are blue quail, while the lighter one is lavender quail (or possibly splash?). Right now I can only guess at their genders. I’m going to post my guess each week until it’s clear what each is, and feel free to post your own guesses in the comments. I’m still referring to them all as female though so I don’t jinx things and end up with three boys. 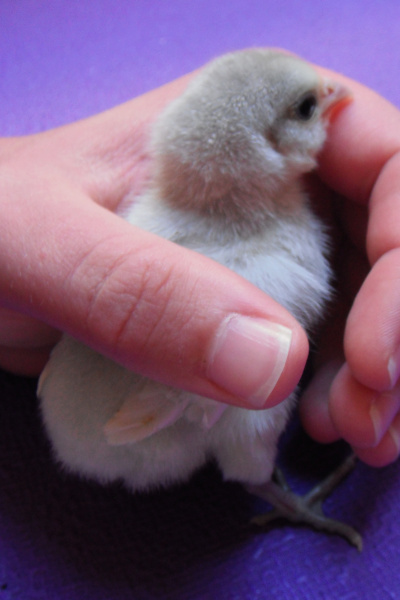 I’m fairly confident in my guess of pullet for this one. She’s the darkest of the blues, usually the calmest/most hesitant to check out new things, the first to start growing her tail feathers, and the first one to start trying to fly. Everything about her is very feminine. Weight: 31 grams. I’m guessing cockerel for this one. 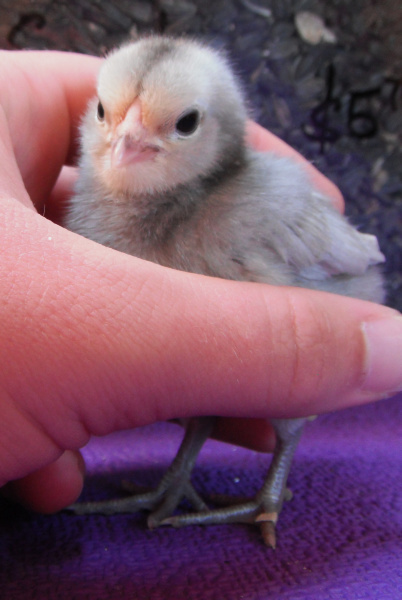 She’s the lighter of the two blues, the smallest chick, generally the bossiest, the first one to start scratching the ground around the feeder, and the biggest complainer. During the drive home the other two chicks mostly just slept, but this one did not want to settle down and kept climbing over the other two and pecking at the box. Weight: 25 grams. 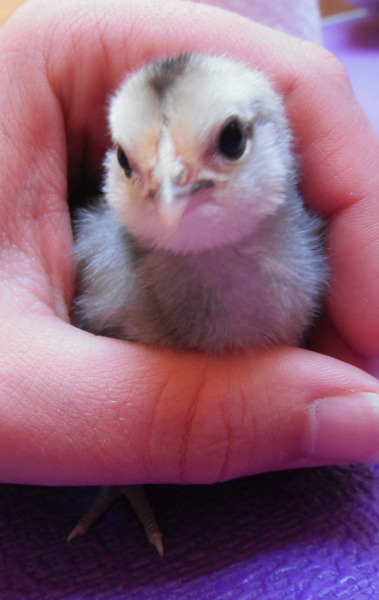 And last, but not least, the lavender chick. I’m torn on my guess for gender with this one. Initially my gut thought was pullet, but she’s becoming very bossy and even shoved the lighter blue aside at the feeder. She’s the happiest about being petted, and when hand fed will climb right into my hand and start scratching around. Weight: 28 grams. So that’s our little foray into chicken-keeping. When we stopped by the feed store to pick up black oil sunflower seeds and grit neither of the people there had heard of these breeds. I admit, it’s kind of cool to have rare chickens. Crap, we’re totally hipster farmers. Whoa, this is so cool! Can’t wait to follow along on your hipster farmer adventure. Should be a lot of fun. I miss our chickens. They’re a riot to own. Good luck, and have fun!! What an awesome adventure! I miss having chickens! The hand raised ones are incredibly affectionate! and smart too! Back in the day, mine learned how to open our gate to come be with us and spent the rest of the time chilling with my horse. Curious how the Suki is with the chics and full grown chickens? Does she kill chickens or is she naturally ok, or has she had training to watch over and not kill? 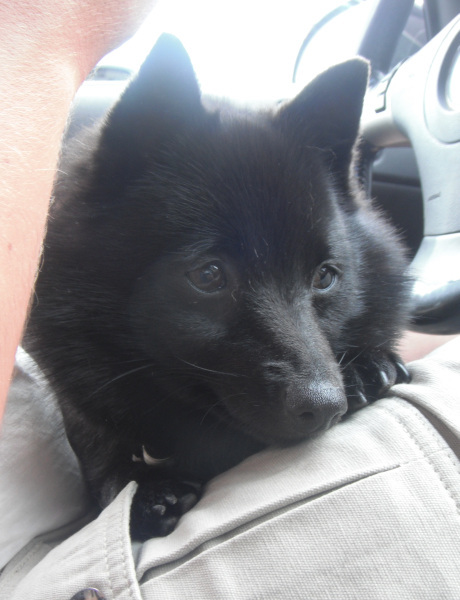 Schipperkes naturally kill small animals especially rodents. Thank you. She’s pretty good with them, but she’s always leaned more towards the herding ancestry moreso than hunting. The most she has done is barked and ran a circle around them. 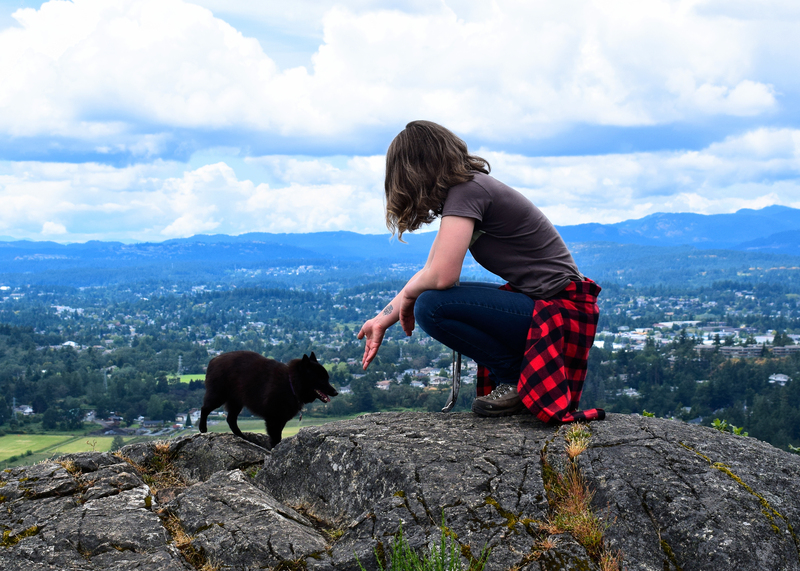 She hasn’t had any special training, but I started out with her around them on leash and if she seemed too interested I wouldn’t let her loose or near them. I wouldn’t take the chance leaving them alone together, but that’s good advice for any breed of dog (even livestock guardian dogs can be tricky with chickens). I think once she realized they were my birds they became something she felt she needed to protect. When my chickens were babies we brooded them upstairs in the office, and if another dog came over she would guard the stairs and not let the other dogs come near the chickens.